UNICA700-I - TARGET Packaging System LTD. Always meet customers' requirements. This has distinguished us for more than 40 years. From this continuous exchange and the technological experimentation of our technicians UNICA700 comes out! 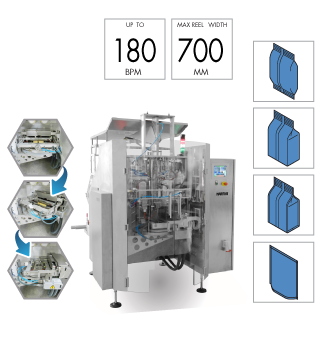 4 bag formats in a single machine: pillow, square bottom, four seals and doypack®. We've made the format change even easier, reducing down times drastically. Now with few simple steps it will be possible to re-configure the entire machine. To a new generation “box motion" movement we have integrated a special circular mechanism that allows the horizontal jaws group to rotate of 90°. Nothing could be simpler! Through a completely renovated touch-screen panel it is possible to change the recipe with a few taps by setting the correct bag size automatically and to have the complete control of the machine. Opening and closing movement of the horizontal jaws by means of a brushless motor. Horizontal jaws group with rotation of 90°. Easily repositionable and replaceable vertical sealing group. Available also with double reel holding shaft. Film automatic motorized lateral centering, driven by two optical fibers which detect its position. Machine automatic stopping device with magnetic sensor, activated when the film reel ends. Film traction by a vacuum pump and perforated belts driven by a brushless motor.